Introduction: The majority of hearing loss in children can be accounted for by genetic causes. Non-syndromic hearing loss accounts for 80% of genetic hearing loss in children, with mutations in DFNB1/GJB2 being by far the most common cause. Among the second tier genetic causes of hearing loss in children are mutations in the DFNB9/OTOF gene. Methods: In total, 65 recessive non-syndromic hearing loss families were screened by genotyping for association with the DFNB9/OTOF gene. Families with genotypes consistent with linkage or uninformative for linkage to this gene region were further screened for mutations in the 48 known coding exons of otoferlin. Results: Eight OTOF pathological variants were discovered in six families. Of these, Q829X was found in two families. We also noted 23 other coding variant, believed to have no pathology. A previously published missense allele I515T was found in the heterozygous state in an individual who was observed to be temperature sensitive for the auditory neuropathy phenotype. Conclusions: Mutations in OTOF cause both profound hearing loss and a type of hearing loss where otoacoustic emissions are spared called auditory neuropathy. The term “auditory neuropathy” was first coined in 1996.13 However, many early reports describe cases now thought to have been AN/AD.14–16 At the time, such cases were considered paradoxical because test findings were inconclusive or contradictory. However, advances in the measurement of OHC function allowed further characterisation of this condition. Approximately 50% of AN/AD patients have no defined aetiology.17 These patients are generally non-syndromic, and some pedigrees suggest a recessive pattern of inheritance based on the presence of at least two affected siblings and unaffected parents. Recently mutations in OTOF, the gene encoding otoferlin were found to cause a non-syndromic recessive AN/AD.2–4 There have been several reports of mutations in OTOF associated with non-syndromic recessive hearing loss (NSRHL).18–23 None of the NSRHL reports defined the status of the OHC in affected individuals, so it could not be determined whether these individuals had AN/AD. We report here the genetic screen of 65 hearing loss families, the discovery of novel otoferlin mutations, and corresponding clinical data on hearing loss in families with pathological mutations. One of these mutant alleles is of particular interest because the phenotype associated with this allele is temperature sensitive. DNA samples and medical information were collected under institutional review board protocols that have been approved by the respective institutions. Sampling included the proband and, if possible, all full biological siblings, both biological parents, and all biological grandparents. In some cases, research participants were asked to undergo complete physical examinations and other appropriate testing, including audiological, vestibular, neurological, and ophthalmological testing. Audiological testing included air and bone conduction puretone audiometry, ABR, tympanometry, AR thresholds, OAE, OAE suppression, speech awareness threshold (SAT) and/or speech reception threshold (SRT) testing. The following scale was used to classify the degree of hearing loss (HL) using pure tone audiometry: 0–20 dB HL as normal, 21–40 dB HL as mild, 41–60 dB HL as moderate, 61–80 dB HL as severe, and >80 dB HL as profound. Denaturing high performance liquid chromatography (DHPLC, using the Transgenomic WAVE DNA Fragment Analysis System; Transgenomic, Inc.) was also used to identify mutations according to the manufacturer’s directions. In the Iowa group (families recruited at the University of Iowa), 18 DFNB1 negative NSRHL families were analysed for allele status with STRP markers (D2S405, D2S158, and D2S1360). Three families with markers segregating consistent with linkage or uninformative for linkage were further screened using single strand conformational polymorphism (SSCP) for all 48 known OTOF exons. Mutations recognised by SSCP were then identified by sequencing. Families where only one mutation was detected were screened by sequencing all 48 known OTOF exons. Mutations were revealed during two independent screens of NSRHL families. In the Nebraska group, STRP genotyping of the OTOF locus was performed on 47 families (38 NSRHL families and nine families with non-syndromic recessive auditory neuropathy (NSRAN) families), 17 (14 NSRHL and three NSRAN) of whom were consistent with linkage to the OTOF locus by haplotyping and were therefore included in the genetic screening. Sixteen families were uninformative for linkage (12 NSRHL and four NSRAN). Fourteen families (12 NSRHL and two NSRAN) were informative and not consistent with linkage. The 17 families consistent for linkage and the 16 uninformative for linkage were included in the mutation screen. Seven mutations believed to be pathogenic were found in five families in this group (table 1, fig 1). Pedigrees of families with OTOF mutations. Proband is identified by arrow. In the Iowa group, 18 NSRHL families were screened with markers linked to OTOF. None of the Iowa families had been previously diagnosed with auditory neuropathy. Of these 18 families, all were informative for linkage but only three were consistent for linkage to OTOF. These families were screened by SSCP. A single missense mutation deemed pathogenic was identified in family 53510 in this group (table 1, fig 1). An audiological summary is given for each family (table 2). We found a high degree of neutral variation within the subject population during the mutation screen; 23 coding polymorphic changes were noted (*denotes alleles found in the Spanish population).20 Eleven of these were missense alleles (158C→T, A53V; 244C→T*, R82C*; 1723G→A, V575M; 2317C→T*, R773S*; 2464C→T, R822W; 3247G→C, A1083P; 3470G→A, R1157Q; 3966C→G, D1322E; 4874G→A, V1625M; 4936C→T, P1646S; and 5663G→A, G1888D), and 12 were silent alleles (372A→G*, T124T*; 945G→A*, K315K*; 1926C→T, N642N; 2022CvT, D674D; 2025G→A, E675E; 2580C→G*, V860V*; 2736G→C*, L919L*; 3189G→A, A1063A; 4677G→A, V1559V; 4767C→T, R1589R; 5391C→T*, F1797F*; and 5655C→T*, R1885R*). Probably the most unusual family of the group is 3467, a family with temperature sensitive AN/AD, with two affected siblings. The variant 1544T→C, I515T was found heterozygously in the father and the two affected children of this temperature sensitive NSRAN family. The maternal mutation is still unknown. The audiogram for individual 3467-1, when she was afebrile, showed a mild low frequency hearing loss and speech comprehension was below the 10th percentile for both quiet and noise. Tympanometry was normal and AR were absent. ABR was abnormal, but CM were present. On two occasions, testing was performed during febrile illness. Her core temperature was defined approximately 2 hours before testing. At a temperature of 38.1°C, her pure tone thresholds decreased to profound deafness in the low frequencies, rising to severe hearing loss in the high frequencies. SAT was 80 dB HL, but she was unable to repeat any of the test spondee words. Tympanometry and OAE were normal, but AR and ABR were absent. With a temperature of 37.8°C, she was tested again and showed a mild to moderate hearing loss and zero speech comprehension. ABR and OAE were not tested. The following day her auditory functions returned to normal after her fever abated. She has reported to her parents that her hearing becomes affected “suddenly” when she is febrile. Both OTOF pathological alleles have been found in family 3456. The maternally inherited mutation is a novel splice site mutation, IVS2 –2A→C. The mutation inherited through their father is a previously published nonsense mutation 2485C→T, Q829X, found in a group of Spanish families and one Cuban family.3,20 Family 3456 is a white family from England with no known Hispanic ancestry, with two sons both having AN/AD. Pregnancy and birth history were unremarkable for the two affected boys except for slight jaundice in the older boy (individual 3467-1). Motor milestones were met at an appropriate age. As is consistent with AN/AD, ABR was absent and OAE were present. Both boys have profound hearing loss and corner audiograms. OAE suppression was tested in individual 3467-1 and, as expected, his OAE were not suppressed, but were instead increased in amplitude. Vestibular function testing in the older boy indicated that there may be a slight hypofunction on the left side. The younger was not tested for vestibular function. Computed tomography scans were normal in both boys, and magnetic resonance imaging in the older boy. Both boys have had positive experiences with their cochlear implants and consider them to be beneficial. Both mutations in family 3466 result in a frameshift. The maternally inherited mutation in exon 17 contains an insertion 1886_1887insA (K629fs). The paternally inherited mutation is a deletion in exon 21, 2348delG (G783fs). This family has two affected children, a boy (3466-1) and a girl (3466-2) with normal OAE and absent ABR. Birth histories were uneventful and developmental milestones, except speech, were attained at a normal age. The children underwent neurological examinations at the age of 5 years (3466-1) and 7 years (3466-2), which were normal. However, 3466-1 may also have a vestibular neuropathy or hypoactive vestibular function, as no nystagmus developed after spinning in a chair and his father reported that the child can spin without falling down. Family 3539 has two affected children with normal tympanometry, OAE and CM, but absent AR and ABR. The daughter was born prematurely at 32 weeks gestation; otherwise, the birth histories were unremarkable. A splice site mutation, IVS18 +1G→T, was found in the maternal allele. The Hispanic nonsense mutation 2485C→T, Q829X has been found heterozygously in family 3450. This family has Mexican ancestry. Both affected children are “typical” of NSRAN, in that OAE and CM are present, but ABR and AR are absent. In the Iowa group of families, an OTOF mutation was found in one family. There were three affected children in family 53510, all heterozygous for 2381G→A, R794H. Two of these individuals had a profound hearing loss while one had a severe to profound hearing loss. All three individuals had a corner audiogram. The two missense mutations occur at amino acids that are conserved by identity in human, mouse, chicken, and zebrafish otoferlin. Missense mutations were considered pathological if: (a) their segregation was consistent with affected status, (b) if no such variant was found in the control population, and (c) the reference amino acid was conserved across vertebrate lines. The I515T mutation is discussed in detail below. The arginine to histidine change, R794H, seen in family 53510 occurs as part of a coiled coil region identified by the SMART/COILS algorithm,34,35 which extends across otoferlin residues 792–820. This is a conservative change as both arginine and histidine are polar basic amino acids. However, arginine is more hydrophilic than histidine and differs significantly structurally. Coiled coil domains are characterised by alpha helixes that interact with one another, potentially forming a “peptide Velcro” interaction with other proteins.36 Weakening the hydrophilic interaction in such a structure could affect an important protein protein interaction disrupting otoferlin function. Marker analysis for the 53510 family was consistent and informative for linkage at DFNB9. None of the mutations considered pathological was detected in a hearing control population of at least 80 individuals. This is the second study to discover a high degree of polymorphic variation at the OTOF locus.3 All the polymorphisms found in the Spanish population were also found in the population described here, and 15 additional neutral variants were discovered. The primary criterion for describing a variant as neutral was the detection of that mutation in a set of normal hearing controls. The proband in family 3467 has abnormal ABR, present OAE, and relatively normal hearing until she becomes febrile, when OAE remain normal but hearing degrades, and ABR worsens from abnormal with unidentified waves I–III and delayed latency of the wave IV–V complex to being totally absent. The amount of decline in hearing in the proband is dependent on the degree of fever. A mild to moderate hearing loss was present when she had a temperature of 37.8°C and a profound hearing loss was present at 38.1°C. Only one mutation has been found in family 3467 thus far, 1544T→C, I515T. This amino acid is conserved in human, mouse, chicken, and zebrafish otoferlin. It is a missense mutation occurring in the otoferlin C2C domain, which was previously found in a consanguineous family from Eastern Turkey with profound prelingual hearing loss.21 No mention was made of a temperature associated phenotype in this family. The affected members of the family from Eastern Turkey are homozygous for the I515T missense mutation and another missense mutation, 1469C→A, P490Q inherited in cis. Eight OTOF mutations were found in six families in this study. In previous studies, four mutations were found in three families2 and 10 mutations were found in six families.3 All other OTOF mutations described are in consanguineous families or in Spanish families homozygous for Q829X.3,20OTOF is a large gene with multiple isoforms coded by at least 48 known exons. The screening of this gene focused on the transcribed part of the gene that is predicted to code for protein and the intron sequence flanking the splice sites of individual exons. The screens employed in this study depended on PCR amplification of genomic DNA and assumes that both alleles are represented equally in the amplified product. Heterogeneity at this locus may interfere with specific PCR primers annealing to specific alleles, preventing the amplification of one allele but not the other. 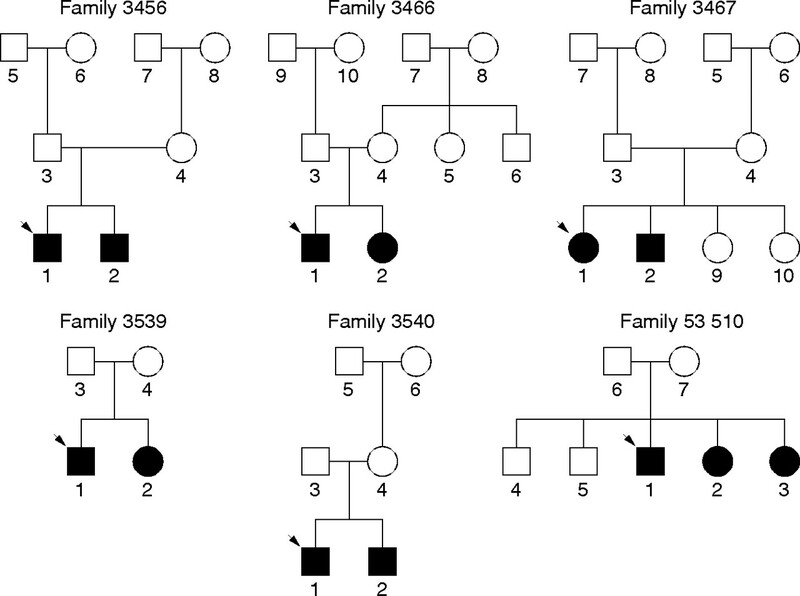 This report summarises the clinical findings associated with eight OTOF mutations, five of them novel, in 65 NSRHL and NSRAN families. One of these families has an allele associated with a temperature sensitive AN/AD phenotype. A temperature sensitive allele for otoferlin should provide a valuable tool to understand the function of otoferlin and its role in the auditory process. This grant was supported by the NIH Center for Hearing Loss in Children 5P60DC00982, the NIH NIDCD Program Project (grant no. 2P01DC0813-07 to W J Kimberling) and the Deafness Research Foundation (to P M Kelley). This study was also supported in part by a grant from the NIDCD (grant nos. R01-DC02842 to R J H Smith and R01-DC02618 to A Starr), and The Oberkotter Foundation to (to C I Berlin and L J Hood). Computing services were provided by the Genetic Sequence Analysis Facility at the University of Nebraska Medical Center and are supported by the Nebraska Research Initiative. Van LL, Cryns K, Smith RJ, Van CG. Nonsyndromic hearing loss. Ear Hear2003;24:275–88. Varga R, Kelley PM, Keats BJ, Starr A, Leal SM, Cohn E, Kimberling WJ. Non-syndromic recessive auditory neuropathy is the result of mutations in the otoferlin (OTOF) gene. J Med Genet2003;40:45–50. Rodriguez-Ballesteros M, del Castillo FJ, Martin Y, Moreno-Pelayo MA, Morera C, Prieto F, Marco J, Morant A, Gallo-Teran J, Morales-Angulo C, Navas C, Trinidad G, Tapia MC, Moreno F, del C, I. Auditory neuropathy in patients carrying mutations in the otoferlin gene (OTOF). Hum Mutat2003;22:451–6. Tekin M, Akcayoz D, Incesulu A. A novel missense mutation in a C2 domain of OTOF results in autosomal recessive auditory neuropathy. Am J Med Genet A2005;138:6–10. Madden C, Hilbert L, Rutter M, Greinwald J, Choo D. Pediatric cochlear implantation in auditory neuropathy. Otol Neurotol2002;23:163–8. Katada A, Nonaka S, Harabuchi Y. Cochlear implantation in an adult patient with auditory neuropathy. Eur Arch Otorhinolaryngol2005;262:449–52. Shallop JK, Jin SH, Driscoll CL, Tibesar RJ. Characteristics of electrically evoked potentials in patients with auditory neuropathy/auditory dys-synchrony. Int J Audiol2004;43 (suppl) :S22–7. Lin CY, Chen YJ, Wu JL. Cochlear implantation in a Mandarin Chinese-speaking child with auditory neuropathy. Eur Arch Otorhinolaryngol2005;262:139–41. Peterson A, Shallop J, Driscoll C, Breneman A, Babb J, Stoeckel R, Fabry L. Outcomes of cochlear implantation in children with auditory neuropathy. J Am Acad Audiol2003;14:188–201. Mason JC, De MA, Stevens C, Ruth RA, Hashisaki GT. Cochlear implantation in patients with auditory neuropathy of varied etiologies. Laryngoscope2003;113:45–9. Miyamoto RT, Kirk KI, Renshaw J, Hussain D. Cochlear implantation in auditory neuropathy. Laryngoscope1999;109:181–5. Rance G, Beer DE, Cone-Wesson B, Shepherd RK, Dowell RC, King AM, Rickards FW, Clark GM. Clinical findings for a group of infants and young children with auditory neuropathy. Ear Hear1999;20:238–52. Starr A, Picton TW, Sininger Y, Hood LJ, Berlin CI. Auditory neuropathy. Brain1996;119:741–53. Davis H, Hirsh SK. A slow brain stem response for low-frequency audiometry. Audiology1979;18:445–61. Prieve BA, Gorga MP, Neely ST. Otoacoustic emissions in an adult with severe hearing loss (published erratum appears in J Speech Hear Res 1991;34:703). J Speech Hear Res1991;34:379–85. Worthington DW, Peters JF. Quantifiable hearing and no ABR: paradox or error? Ear Hear1980;1:281–5. Starr A, Sininger YS, Pratt H. The varieties of auditory neuropathy. J Basic Clin Physiol Pharmacol2000;11:215–30. Adato A, Raskin L, Petit C, Bonne-Tamir B. Deafness heterogeneity in a Druze isolate from the Middle East: novel OTOF and PDS mutations, low prevalence of GJB2 35delG mutation and indication for a new DFNB locus. Eur J Hum Genet2000;8:437–42. Houseman MJ, Jackson AP, Al Gazali LI, Badin RA, Roberts E, Mueller RF. A novel mutation in a family with non-syndromic sensorineural hearing loss that disrupts the newly characterised OTOF long isoforms. J Med Genet2001;38:e25. Migliosi V, Modamio-Hoybjor S, Moreno-Pelayo MA, Rodriguez-Ballesteros M, Villamar M, Telleria D, Menendez I, Moreno F, del C, I. Q829X, a novel mutation in the gene encoding otoferlin (OTOF), is frequently found in Spanish patients with prelingual non-syndromic hearing loss. J Med Genet2002;39:502–6. Mirghomizadeh F, Pfister M, Apaydin F, Petit C, Kupka S, Pusch CM, Zenner HP, Blin N. Substitutions in the conserved C2C domain of otoferlin cause DFNB9, a form of nonsyndromic autosomal recessive deafness. Neurobiol Dis2002;10:157–64. Yasunaga S, Grati M, Cohen-Salmon M, El-Amraoui A, Mustapha M, Salem N, El-Zir E, Loiselet J, Petit C. A mutation in OTOF, encoding otoferlin, a FER-1-like protein, causes DFNB9, a nonsyndromic form of deafness. Nat Genet1999;21:363–9. Yasunaga S, Grati M, Chardenoux S, Smith TN, Friedman TB, Lalwani AK, Wilcox ER, Petit C. OTOF encodes multiple long and short isoforms: genetic evidence that the long ones underlie recessive deafness DFNB9. Am J Hum Genet2000;67:591–600. McNeil PL, Kirchhausen T. An emergency response team for membrane repair. Nat Rev Mol Cell Biol2005;6:499–505. Bansal D, Miyake K, Vogel SS, Groh S, Chen CC, Williamson R, McNeil PL, Campbell KP. Defective membrane repair in dysferlin-deficient muscular dystrophy. Nature2003;423:168–72. Wahlberg JM, Spiess M. Multiple determinants direct the orientation of signal-anchor proteins: the topogenic role of the hydrophobic signal domain. J Cell Biol1997;137:555–62. Ott CM, Lingappa VR. Integral membrane protein biosynthesis: why topology is hard to predict. J Cell Sci2002;115:2003–9. Britton S, Freeman T, Vafiadaki E, Keers S, Harrison R, Bushby K, Bashir R. The third human FER-1-like protein is highly similar to dysferlin. Genomics2000;68:313–21. Keen TJ, Inglehearn CF, Green ED, Cunningham AF, Patel RJ, Peacock RE, Gerken S, White R, Weissenbach J, Bhattacharya SS. AYAC contig spanning the dominant retinitis pigmentosa locus (RP9) on chromosome 7p. Genomics1995;28:383–8. Berlin CI, Hood LJ, Hurley A, Wen H. The First Jerger Lecture. Contralateral suppression of otoacoustic emissions: an index of the function of the medial olivocochlear system, Otolaryngol Head Neck Surg1994;110:3–21. Hood LJ, Berlin CI, Bordelon J, Rose K. Patients with auditory neuropathy/dys-synchrony lack efferent suppression of transient evoked otoacoustic emissions. J Am Acad Audiol2003;14:302–13. Starr A, Sininger Y, Winter M, Derebery MJ, Oba S, Michalewski HJ. Transient deafness due to temperature-sensitive auditory neuropathy. Ear Hear1998;19:169–79. Singh G, Lykke-Andersen J. New insights into the formation of active nonsense-mediated decay complexes. Trends Biochem Sci2003;28:464–6. Letunic I, Goodstadt L, Dickens NJ, Doerks T, Schultz J, Mott R, Ciccarelli F, Copley RR, Ponting CP, Bork P. Recent improvements to the SMART domain-based sequence annotation resource. Nucleic Acids Res2002;30:242–4. Lupas A. Coiled coils: new structures and new functions. Trends Biochem Sci1996;21:375–82. Mason JM, Arndt KM. Coiled coil domains: stability, specificity, and biological implications. Chembiochem2004;5:170–6. Payne AS, Kelly EJ, Gitlin JD. Functional expression of the Wilson disease protein reveals mislocalization and impaired copper-dependent trafficking of the common H1069Q mutation. Proc Natl Acad Sci USA1998;95:10854–9. Berson JF, Frank DW, Calvo PA, Bieler BM, Marks MS. A common temperature-sensitive allelic form of human tyrosinase is retained in the endoplasmic reticulum at the nonpermissive temperature. J Biol Chem2000;275:12281–9. Santana A, Salido E, Torres A, Shapiro LJ. Primary hyperoxaluria type 1 in the Canary Islands: a conformational disease due to I244T mutation in the P11L-containing alanine:glyoxylate aminotransferase. Proc Natl Acad Sci USA2003;100:7277–82.